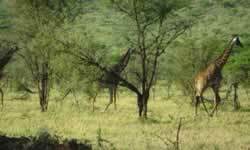 Tanzania is a land of wonderful scenery, gentle and friendly people and unbelievable game reserves. On this 7-day safari, let us take you to some of the best game parks in Africa. After arriving in Arusha, travel to Lake Manyara, in the spectacular Rift Valley, home to many African animals and birds. At Ngorongoro Crater enter a Noah’s Ark world of varied habitats and countless animals confined within the cone of an extinct volcano. Next visit Oldupai Gorge, the archaeological site, often referred to as the ‘cradle of mankind’. Then enter the great Serengeti Game Reserve. During the migration season, see the ‘greatest show on earth’ as literally thousands of wildebeest and zebra head north following the cycle of rains in search of fresh grassland. On arrival at Kilimanjaro International Airport (JRO) we will meet and transfer you to your hotel in Arusha. The balance of the day is at leisure. The morning is at leisure. Following lunch in Arusha and a safari briefing, at 14h39 drive to Manyara National Park, famous for its lovely views of the Rift Valley. After arriving at the lodge, enjoy its amenities and wonderful infinity pool. Tour the park renowned for a large elephant and buffalo population, and elusive tree-climbing lions. Depart for Ngorongoro Crater, and after checking in at your lodge the balance of the day is at leisure. 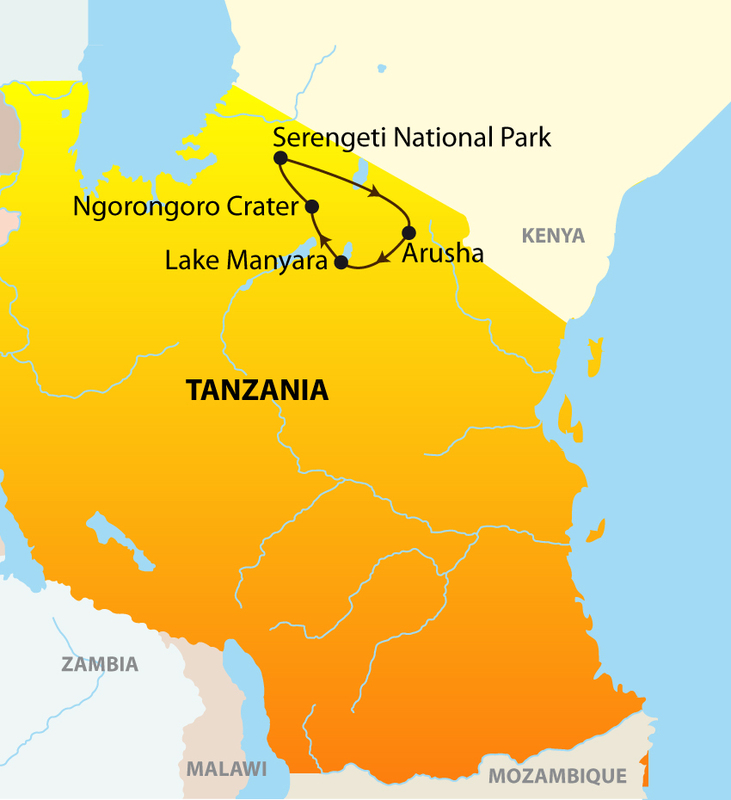 This morning visit the crater floor (up to 6 hours with a picnic lunch at a permanent site with toilet facilities), considered the “Eighth wonder of the world” with its habitats of grassland, forest and swamp, and a lake that is home to flamingoes and many other species of birds. Return to the lodge for the balance of the day at leisure. There is an optional visit to a Maasai Village (additional cost) before driving to the Oldupai Gorge, the famous site where traces of pre-historic people dating back to 3.5 million years were discovered. Then enter the Serengeti Park enjoying game viewing and a picnic lunch en route to the lodge. Today enjoy two wonderful game drives, exploring this world-famous park with its large concentrations of game such as zebra, wildebeest and antelope and the ‘Big Five’. This is also where seasonally the great Migration of wildebeest & zebra happens. You may wish to book an optional hot air balloon safari very early this morning. Enjoy a game drive en route to the Seronera airstrip where you will board a scheduled light aircraft flight back to Arusha. Lunch in Arusha. After lunch you will be transferred to Kilimanjaro International Airport (JRO) for your onward flight. A day room at Kia Lodge is available at an additional cost. Maximum baggage is 15kg (including carry-on) in soft-sided luggage per person. No hard suitcases or bags with wheels.